I​n a recent independent study, we tested our newest high-performance wheel gearbox, the Reinke-UMC® 740-U-AD™ 10/16, against our competition’s 8000 model gearbox, and our own field proven standard wheel gearbox. 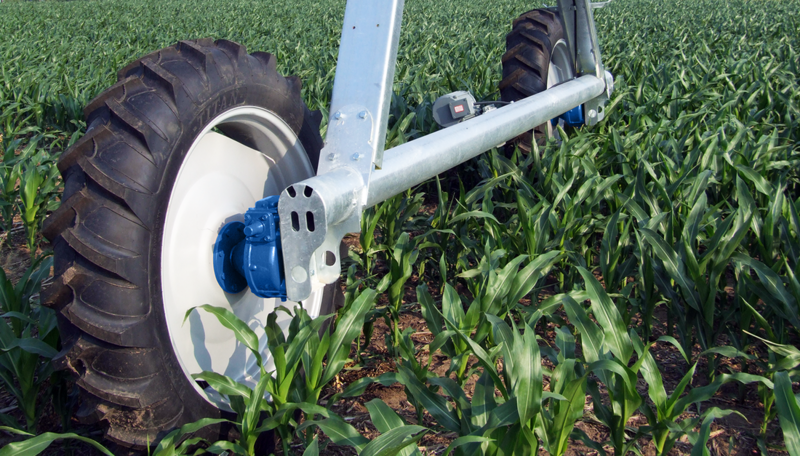 The results were nothing short of game changing as the Reinke-UMC® 740-U-AD™ 10/16, outperformed both, making it the new standard in wheel gearbox load capacity and longevity for electric center pivots and laterals. Due to these impressive results, Reinke provides a 10 year or 16,000 hour warranty to match its stature. 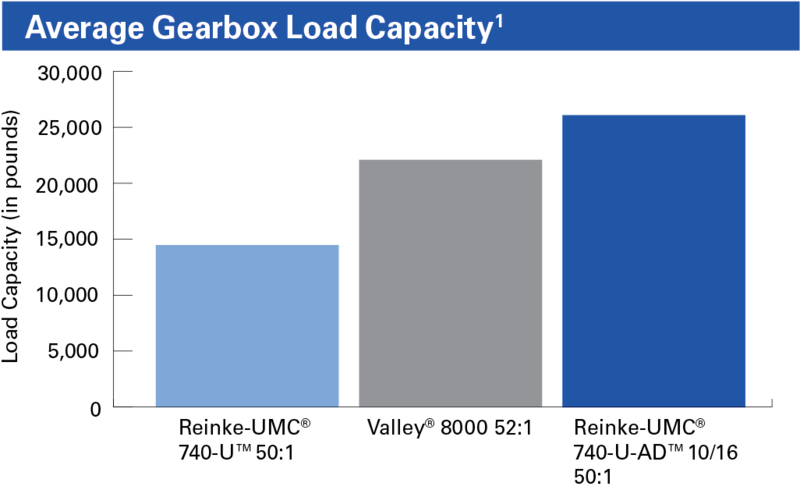 The first test performed was the average gearbox load capacity test, which measures the amount of load applied to the gearbox before it begins to “growl” or make noise, signaling the point at which extreme gear wear begins. Over powering the competitor by more than 22 percent! 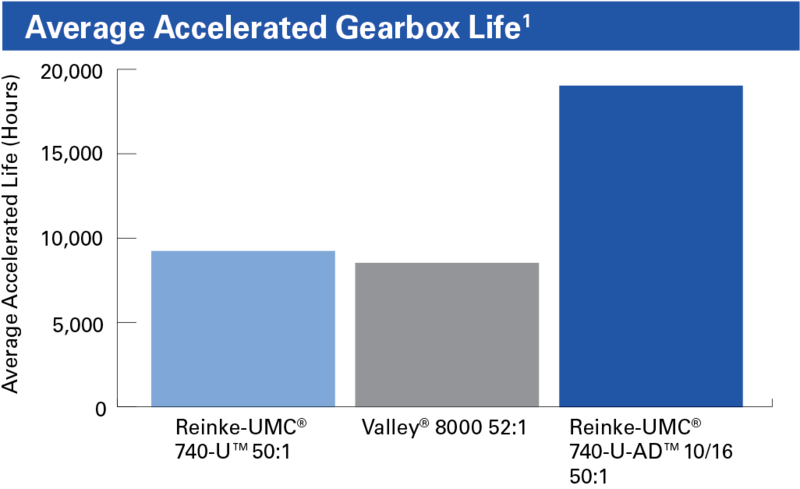 ¹The average gearbox load capacity measures the amount of load applied to the gearbox up to the point where extreme wear begins. The next test performed was the average accelerated gearbox life test. This test approximates the life of the gears under a constant overload condition. Average life is calculated from gear wear resulting from the test. The Reinke-UMC® 740-U-AD™ 10/16 gearbox significantly outperformed its predecessor and experienced roughly half the amount of gear wear compared to its 8000 model competitor under the same test conditions. Best wheel gearbox warranty of 10 years or 16,000 hours. ¹The average accelerated life approximates the life of the gears under a constant overload condition. Average life is calculated from gear wear resulting from the test. The superior performance of the Reinke-UMC® 740-U-AD™ 10/16 gearbox in terms of load capacity and life is why only Reinke can offer the best wheel gearbox warranty in the industry of 10 years or 16,000 hours. Are you eager to learn more? We thought so. Your local Certified Reinke Dealers are here to help. You can call or just stop by, and they’ll discuss the product and warranty with you in person. UMC®, 740-U™ and 740-U-AD™ are trademarks of Universal Motion Components Co., Inc. Multiple Reinke-UMC® 740-U™ and Reinke-UMC® 740-U-AD™ 10/16 gearboxes were tested against multiple Valley® 8000 gearboxes. Tests were performed in a head-to-head comparison, in a controlled environment and in a standard manner to ensure an accurate comparison. The accelerated life shown in the graph does not reflect expected life in the field. Valley® is a registered trademark of Valmont Industries, Inc.